2. The prepayment amount for group bookings can be refunded in case of reservation changes or cancellation more than 7 days prior to arrival. In other cases, the prepayment cannot be refunded. Please note that any bank charges applied to the transaction should be deducted from the prepayment amount. 1. The hostel reserves the right to withdraw immediately a prepayment from the credit card provided upon the reservation. Prepayment should be calculated as 50% of the total amount, but not less than the 1st night reservation fee. 2. In case the prepayment is not paid immediately upon the reservation, it is to be paid within 7 days of reservation. 3. Total amount is to be paid no later than 7 days prior to arrival. Please note that for the group bookings for more than 6 people or on the total reservation amount more than 3000 UAH, different prepayment policies may apply. Please note that if the reservations are made for 6 guests, the hostel has a right to charge the prepayment from the card. Large groups (more than 30 people) is a subject to availability. 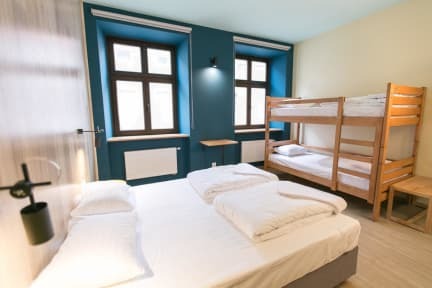 The Hostel Manager reserves the right not to accept large groups, depending on the individual situation (availability, number of nights etc) or to charge the prepayment. Please contact the property directly for the group reservation details. DREAM Hostel Lviv is an inspiring place in the heart of the old town, where you will find everything for the perfect stay: warm friendly atmosphere, awesome people to meet, secure rooms and clean comfortable beds. Our Hostel is located only few steps from the Rynok square (main square of Lviv), so you can easily access all of the main tourist attractions by foot. 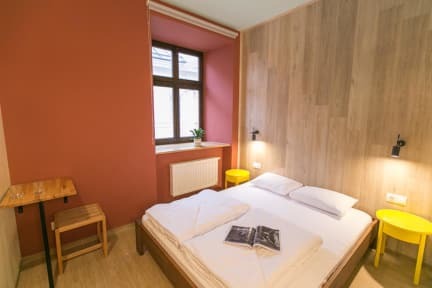 DREAM Hostel Lviv is the biggest modern hostel in Lviv that combines high standards of hotel and cozy atmosphere of hostel. It’s the only hostel in Lviv with its own Café & Bar DRUZI where you can order breakfast or spend a wonderful evening. You are more than welcome to spend some time with other dreamers in our common areas: the whole floor with common kitchen, big common space and cozy courtyard is at your disposal! Also, our “hosts” organizes events 3 times a week. Don’t hesitate to join us for cooking classes of local food, learning Ukrainian language or for some drinks at bar-crawls! Sounds good for you? So, come and explore the city with us ;) We can’t wait meeting You at DREAM Hostel Lviv! Standard Cancellation policy: 48h before arrival (may vary for different types of rates and for special events). For early check-in from 8.00 AM (from 6:00 AM for private rooms) till 14.00 AM additional payment is 50% of price. For late check-out from 11.00 AM till 3:00 PM additional payment is 50% of price. Late check-out after 3:00 PM should be paid in amount of 100% of the room rate, according to the pricing policy. Auberge parfaite sur tous les niveaux!